1. Preheat the oven to 220°C, gas mark 7. Using a large knife, cut the chicken breasts into thin strips, then finely dice. Combine the chopped chicken with the onion, spices, pine nuts, ½ the mint and 2 tbsp tomato paste. Season. 2. Spread the remaining 1 tbsp tomato paste over the flatbreads, almost to the edges, then spread the chicken mixture over the top. Put 2 flatbreads on separate baking sheets and bake for 10 minutes, swapping around in the oven halfway through. 3. Meanwhile, toss the celery with the yogurt, garlic, 1 tbsp lemon juice and the remaining mint; season. 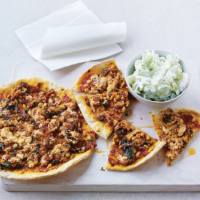 Cut the first 2 flatbreads into wedges and enjoy straight away with a squeeze of lemon and the celery salad; baking the third flatbread as you eat.